It’s amazing how we are able to connect music to the settings that surround us in our everyday lives. Whether it’s through digital media or physical beauty, there is certain music that is simply enhanced by or enhances things we observe. What would the major motion picture “Friday Night Lights” be without the inspiring soundtrack of Explosions In the Sky? Would the film hit as hard without the melodic post-rock sound? In my opinion, probably not. Some people out there may find it immature that my geographic surroundings control what I choose to listen to throughout my days, personally I believe that’s just how it should be. In my home town of Austin TX the sun has began to peak out of the clouds and the temperature has risen moderately to a steady 75 degrees. 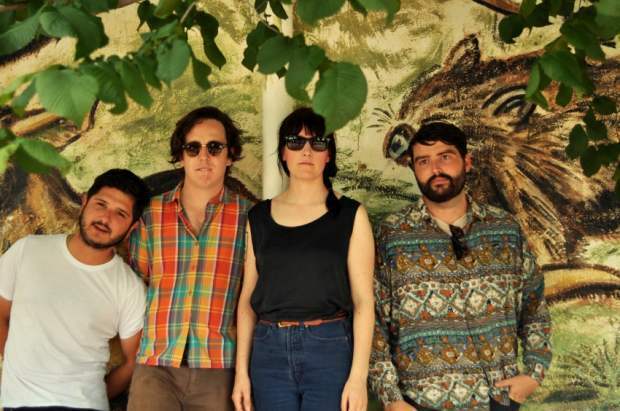 The season of Sprummer (the transition from Spring to Summer) has taken over, and I couldn’t be any happier sitting outside under the oak trees writing about this wonderful new song from Harrisburg, Pennsylvania band Uwue. Silent Wave is a sweet, tender piano driven tune that everyone should be listening to outside, in the sun, or under a tree. Front-man Caleb Cossick’s high, falsetto vocals are truly a breath of fresh air as they command the slow, lush piano progression. A steady backing drum beat, and bass-line complete what is one of the most addicting songs I’ve heard this entire year. To fully appreciate the beauty behind Silent Wave, you must put yourself in a bright, natural setting in order to feel the true connection between Cossick’s plush creation and the rich liveliness that Spring presents. So go to Uwue’s bandcamp, download the It’s All Lore/Silent Wave 7” and chill with the sun, flowers, trees, and maybe even your cute, local forest animals. This entry was posted in Uncategorized and tagged Austin TX, Caleb Cossick, Explosions In the Sky, Friday Night Lights, It's All Lure 7'', Silent Wave, Spring, Sprummer, Summer, Tree Cover Records, Uwue on April 8, 2013 by theendlessbummer. I’ve got a ton of great memories from my youth. A ton. Our crew of friends was kind of like the crew of The Sandlot mixed with the deep fraternity of the Stand By Me kids. And now, in my freshman year of college, I’m a slightly more nostalgic person than the usual past-obsessor I always have been. I can remember as far back as fourth grade listening to Blink-182’s “Story of a Lonely Guy” on my walkman, daydreaming about the “simplicity” of second grade as the school bus wheels rolled on; I guess I’ve always been a cinematic nostalgic. And I say that without vanity. But one memory has been replaying in my head recently and I believe Freud would attribute its repetition to Summer’s departure. I went to a Real Estate/Twerps show with two of my best friends in Austin back in April. The weather was perfect, not too hot and not too cold, complimented by a pleasant breeze. I had on a nice slightly hip denim shirt with a Black flag undershirt, khaki shorts and boat shoes. It was one of those rare occurrences where you look in the mirror and everything feels just right. I was not too familiar with Twerps with the exception of their single, “Dreamin’.” As the band started, I was instantly hypnotized by their breezy jangle-pop. The sun began to go down and the stage lights came on, illuminating the crowd with a shimmering blueish silver glow. The smell of philosophy major clove cigarettes filled the venue, and the accidental splash of cheap beer was rampant. The majority of the crowd conversed with each other and occasionally somewhat ignored the band– including myself, to make jokes with my friends. After I took a screenshot of the “Twerps” google search to remind myself to look into them, Real Estate took the stage. It was completely dark outside, only the stage lights, the venue’s christmas light job, and the sporadic lighter caused illumination. The four-piece opened up with a killer rendition of “Easy,” and oh boy, did I take it “easy.” My eyes hooked onto the casual appearance of the band, my ears latched onto the shimmering waves of the breeze guitar, drums, and bass, and my mind turned to complete positive mush. Everything was perfect. In recent years, the independent world has garnered up an intense interest in summery nostalgia. From Real Estate’s beautiful sleeper hit, Days, to Urban Outfitter’s seemingly increasing floral shirt prints to even mainstream society’s fascination with grainy sea-oriented photography, the sentimental seashore machine is up and running. I have definitely been sucked in. I love the laid-back, six-beachside-beers-in aesthetic of older bands like The Feelies and selected Yo La Tengo. I’m a sucker and hypocrite when it comes to the photography, claiming not to like the Instagram worthy prints of the shore but secretly doing so. The aesthetic is alive and well and I believe it is for the greater good. Twerps, a group of shaggy haired Melbourne hipsters, released their self-titled debut in 2011 via Underwater Peoples. The album was full of catchy jangle-pop riffing, intriguing lyricism, bumbling surf rock bass, and unexpectedly, beautiful sad pop ballads. It deserved much more attention. Well the Melbourne bohemians are back, following their same catchy yet dense musical mixture, with their new single, “Work It Out.” The song begins with an oh-so 90’s chord progression, drawing on memories of Galaxie 500 and employing a straightforward, Silver Jews-esque melody. As the drums mellowly kick in, the overtly Feelies influenced lead guitar riff follows suit, eventually cascading into a nice tremolo drenched chord strike. Guitarist/vocalist, Marty Frawley is assertive and pissed off. He blatantly tells his (now ex) girlfriend “We’re threw. Yeah me and you. Done, done, we’re threw.” Frawley doesn’t give into cynicism; he gives a universal, get-on-it suggestion for relationship issues singing, “work it out, do it now, you get back, as much as you put in.” His confidence is inspiring to say the least. Twerps have seemed to have ditched their previously timid and skinny nervous white boy attitude in exchange for a more opinionated and didactic mood; and it’s working well. They haven’t lost their Jersey shore laziness, they’ve just grown older from the days spent drinking Coronas, strumming their six strings and smoking menthols while nesting on their beachside adirondack chairs. This entry was posted in Uncategorized and tagged Austrailia, Beach, Blink-182, boat shoes, chill, clove cigarettes, Coronas, Dreamin, facebook, Fall, gorilla vs bear, hipstamatic, hipsters, indie shuffle, Instagram, lo-fi, Marty Frawley, Matt Mondile, Melbourne, New Jersey, New Zealand, Pitchfork, Real estate, SilverJews, Spring, stand by me, Summer, the feelies, The Shins, Twerps, Twitter, Underwater Peoples, urban outfitters, Winter, Work It Out, yo la tengo on September 13, 2012 by theendlessbummer.